Claire, my youngest, insisted it was time to get with the program and made me brave the attic to rescue the plastic bin of Halloween decorations. But our Tupperware tomb held only one plastic jack-o-lantern and a couple of wilted spiders, so Claire took matters into her own hands. 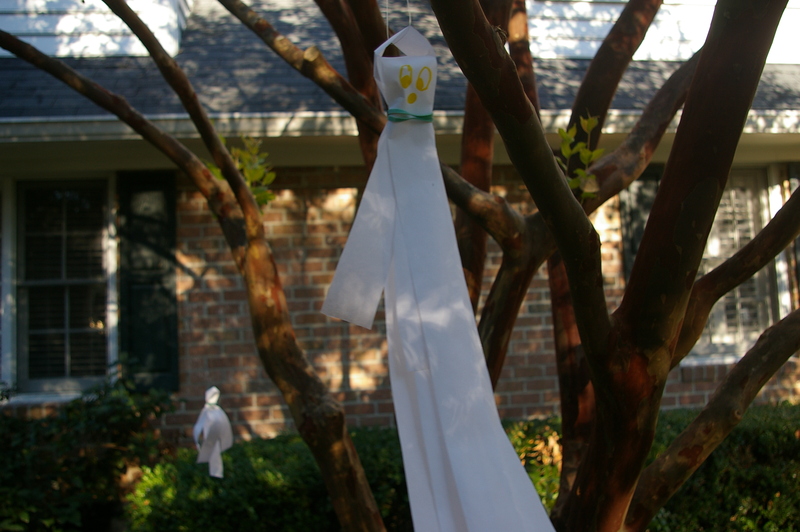 She made ghosts out of recycled grocery store receipt paper, and hung them in our crepe myrtle, then found some orphaned tiles from a bathroom rehab project, and concocted a graveyard. This from my child who follows me around the house like a puppy — skittish and scared to be left alone. Her safe, happy, little haunting. I’m fascinated by autumn’s macabre harvest. The desperate, clawing fake hands people plant in their front yards like body parts blooming from the underworld. Sheets lynched in trees and dangling skeletons dancing a jig in the breeze. Small terror becomes our amusement. We externalize our fears and trick or treat ourselves into comfort. Our days of the dead sweetened by a haul of Tootsie rolls and M&Ms. 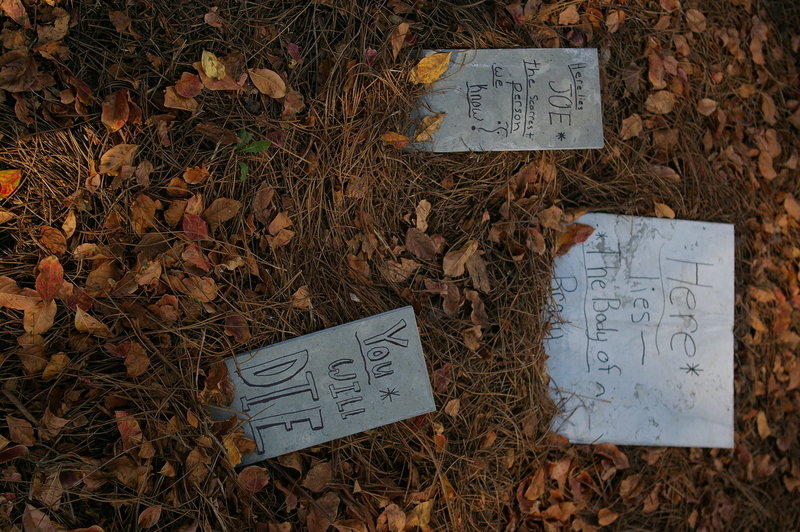 Claire engraves her faux gravestones with a Sharpie, and plots her costume (a Greek goddess). But I’m not quite in the spirit yet; it feels a little close this year. Which I guess is what Halloween is all about, a reminder that it’s always close. That the other side lurks behind a thin veil. A sheet just dancing in the breeze. ~ by Stephanie on 10/21/2010. Thanks for another way of being with all the neighborhood goblins. I will let them be reminders, then, of passages closer than we imagine. And thanks to Claire, for her creative initiative. Perhaps she knew what was needed, and now. Seems that Claire has your imagination. Gathering the other night was most memorable and duly honorable to Tom and his family. Best of times for the days ahead.